A project in development by the Australian Literacy and Numeracy Foundation aims to revolutionise the teaching and learning of literacy in indigenous communities across Australia. In being short-listed, the ALNF has been granted $250,000. If the project is selected by Google’s judging panel on October 26 or through a people’s choice award, the charity will be granted a further $750,000, an opportunity that galvanises Ms Mendel’s resolve to reconcile the history of neglected indigenous welfare. The ALNF’s Living First Language Project aims to revitalise and preserve endangered indigenous languages, while simultaneously teaching literacy in English and first languages. Over three years, the platform will be made available to various indigenous language speakers across the country, potentially ­affecting the lives of 270,000 individuals who identify language as part of their heritage. The project has two halves, a Dynamic Community and Children’s Dictionary, and an associated Sounds and Letters app. Each language will have its own dictionary. The prototype includes Anindilyakwa, Pitjantjatjara and Yankunytjatjara speakers but has the potential to cover all of Australia’s living languages. Each dynamic dictionary entry includes text, audio recordings and video of speakers. Indigenous communities can contribute their own words and translations. 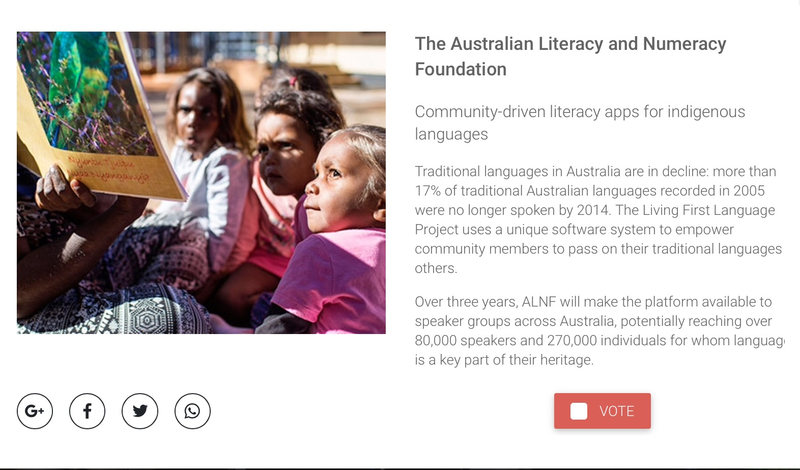 ALNF executive educational adviser Eric Brace says the innovation came about as the charity built digital dictionaries for indigenous peoples in APY lands in South Australia’s northwest. “We realised what we were doing for communities could actually be leveraged and facilitated by a community, if we gave them the tools,’’ Mr Brace said. The second half of the project, an early childhood sounds and letters app, integrates with the ALNF’s years of work in developing literacy tools for indigenous first language speakers. The application draws from the dynamic dictionary and simultaneously teaches children literacy skills in both English and their own first language. With simple and fun interfaces, children are educated on the phonetics of their language without compromising accents or sounds in translation to an English alphabet. As the two sides of the project develop, potentially any indigenous language can be recorded by speakers into the dictionary, which would then automatically generate a corresponding version of the early childhood app. ALNF co-founder Mary Ruth Mendel describes the future of the project as magic for indigenous communities. The project is short-listed as one of 10 entries in Google’s 2016 Australian Impact Challenge.